As Valentine’s Day and the season of Great and Holy Lent are soon approaching, I offer a recommendation for a recently published book titled Building an Orthodox Marriage: A Practical Commentary on the Eastern Orthodox Marriage Rite by Bishop John Abdalah and Nicholas G. Mamey. This book explains the theology of the Orthodox Marriage sacrament and describes the reasoning behind each part of the service. The authors use numerous biblical, traditional, and societal connections and reasonings to explain the fullness of the service. For those wanting to have a deeper understanding of the marriage service, this book is very accessible. Its organization makes it easy to look up one part of the service for those times when you need a quick review or reminder of a particular section. In a somewhat brief, but thoughtful ending to the book, the writers include a part that offers “Helpful Thoughts for Strengthening Marriages to be Further Explored” and an appendix with a list of “Questions for Orthodox Courting or the Newlywed Game”. These sections instantly brought me back to my own marriage counseling experience for our wedding preparation ten and half years ago. I remember the nerves while taking the test…..will we fail? How can our many flaws gain our counselor and priest’s marriage approval? My husband had just recently converted, having grown up with a Protestant background. In addition to having different faith backgrounds, our approach to faith itself was very contrastive, reflecting the way we were raised in our families. My husband approached faith with a critical and questioning mind, and I was raised with more of a mindset to accept the faith with a “leap” of trust. Discussing our faith with a counselor brought many of our different opinions to the surface! The book mentions, “The mystery of marriage and its sacramentality are found in the grace of God, which is granted to the participant for the ability to bear the intense experience and inexplicable transformation of, and participation in, becoming one mind and one flesh with another” (35). In addition, there are some references throughout the book to the idea that man and woman, although are created in a certain order, are very much equal, “In the Genesis account, man is created last, but woman comes from his side or his rib. The formula is brilliant! Woman is of equal substance as man and is neither above nor below him [Gen 2.21]” (93). Reading these passages and reflecting on my own experience within marriage, the mystery of unity that happens was revealed to me as an extension of each other. Although our differences are challenging to work through sometimes, it has also been one of my biggest blessings as I am able to extend my understanding of the faith through his eyes and see it from a more critical angle that leads me to explore more of the faith. I am thankful to be united with someone who challenges my view of the world and the faith in a loving way and gives such insight to life. Together, on an equal standing before God, we have been united and are continually transforming. I pray that we will grow in a way pleasing to God. Valentine’s Day is fast approaching…..along with Lent! I highly recommend this book as a good Lenten read to anyone longing to understand the marriage ceremony – perhaps you are engaged, or simply dating and want to look deeper into what entering that part of your life may mean. Or you are already married and are wanting to reflect on your own experiences in that journey. This book held some surprises for me as I read it, things I never realized about what God offers us in this holy mystery, and it also helped me to see the awe in how uniting with another is continually working to transform me! This entry was posted in Uncategorized on February 8, 2018 by admin. I’ve always been intrigued with Christian rock bands and even considered forming one myself. That being said, for the first edition of Soul Notes I wanted to talk a little about the different degrees in which certain bands distinguish themselves as Christian rock. There were many to choose from, but for me, the following four bands came to mind first. I know I’m probably dating myself when I bring up the band Stryper, but these guys were one of my favorite rock bands growing up and still are. Their music is heavy and melodic, coupled with the fact that they boldly talk about Christ in their lyrics is inspiring to me both as a rock musician and Orthodox Christian. 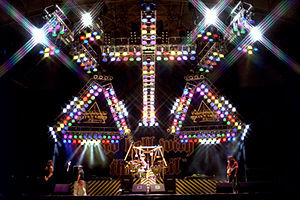 Stryper was a pioneer of the heavy Christian rock music scene and some would arguably call them the first of its kind! Many groups have since followed their example. Regardless, Stryper gained popularity both in the mainstream and Christian markets and still enjoy a very loyal following today. Although I used to be a larger fan of U2 in my younger years, I grew to appreciate a bit more of a technical and heavy sound these days. I still enjoy a lot of their music and respect them as musicians. I’ve heard them described as a “semi-secretly Christian rock band”. Because they reference the Bible in over 50 of their songs, I would say that the secret is out! Though their crossover appeal is also extremely evident as a secular band. So, is U2 a Christian rock band? I think we would first need to look to their lead singer to gain some insight into that question. Although Bono is obviously a man of faith, the band’s lyrics lack that kind of boldness. They have more of a “feel good, you fill in the blanks yourself” if you want them to have a Christian vibe or just a spiritual one. I leave it up to the listener to perceive for themselves if they are a Christian rock band or not. To be honest, I don’t know a lot about Petra and haven’t listened to a lot of their music, but to not include them in this conversation would be a big oversight. Their group is all Christian all the time! Every song has a clear theme and focus. They have been around since 1975 and are regarded as a pioneer of the Christian rock and contemporary Christian music genres. I would think that Petra has no issues with being labeled as a Christian rock band. With songs like “Hallowed Be Thy Name”; “We will worship the Maker of all things Almighty God, to You our voices sing Hallowed be Thy Name”, it is evident in their lyrics that Petra clearly has a strong Christian message. Love this band! “On Fire” is the song my wife and I used for our first dance at our wedding reception and holds a special place in my heart. Not necessarily a song full of bold “Christian” lyrical content, but it does allude to love as a “mystery.” As an Orthodox Christian, I thought it to be a poignant and appropriate theme for marriage. 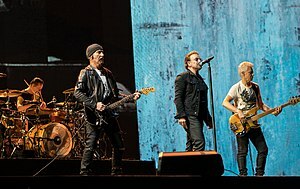 Both Jon and Bono’s comments about their faith are bold statements and a testimony to their Christian beliefs, which is carried over to their music. I can’t help but feel uplifted when I hear U2’s “Where the Streets have no Name” and Switchfoot’s “On Fire.” But there is also something to be said about groups like Stryper and Petra whose sole purpose is to minister to their fan base through bold Christian-focused lyrical content. The bands that I chose to highlight above are groups from my era, but there are several modern bands that also fit into this conversation. Sons of Leon, composed of 4 brothers whose father is a Pentecostal preacher. 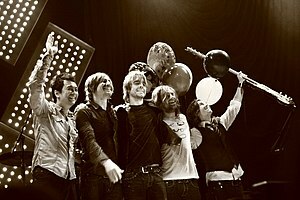 Many of their songs deal with the topic of redemption. Their lyrical content is a bit more vague than groups like Stryper and Petra who leave you inspired and are very intentional in their message. Mumford & Sons, band leader Marcus Mumford’s parents are leaders in the evangelical Vineyard Church in England, and he’s a member of that church to this day. Most of his songs reflect his spirituality, some more directly than others. The Avett Brothers, a hugely popular cult band in the indie-folk world, they have been accepted as basically a secular act even though a lot of their lyrics are very clearly about their Christian faith. I find it to be a special calling and commend all the groups and artists, labeled either Christian, secular, or mainstream, who recognize their platform as an opportunity to share the message of our Lord and Savior, Jesus Christ with people who may have never had heard the good news if it were not for their music and personal testimonies. I encourage you to explore these groups and others keeping in mind the message of Jesus Christ. Are there some that speak more loudly to you? This entry was posted in Articles, Uncategorized and tagged music on January 17, 2018 by admin. In this Nativity season, you’ll probably hear how the prophets foretold the birth of Christ. But if that’s all you hear from the prophets, you are missing most of what God wants you to hear. The prophets weren’t primarily concerned with predicting the future. They had three main messages that people – including us – usually don’t want to hear. Message #1: I am the Lord your God, and you shall have no other gods before me. The First Commandment seems easy to keep, right? But it’s not. When we delight in something forbidden by God’s law, we put ourselves before God. When we scramble after security in an unpredictable world , we put our trust in things and earthly powers instead of God. Only when we forsake our pleasures and securities and completely trust in God do we become true followers of the first commandment. “But no one can be completely free from idolatry, then,” you may say. This is true. So is our situation hopeless? “Now says the Lord your God, ‘Turn to Me with all your heart, with fasting and wailing and with mourning; rend your heart and not your garments.’ Return to the Lord your God, for He is merciful and compassionate. He is longsuffering and plenteous in mercy…” Joel 2: 12-13. God will hear your prayer of repentance and forgive you. Then he’ll command you again: love your neighbor. The prophets repeatedly tell us to have a special concern for the poor – and by “poor” they mean anyone who is vulnerable. So you must always ask yourself: Do I notice the poor and vulnerable around me? Do I actually love them the way God loves me? These are not easy messages to hear, for they remind us that God’s judgment is upon us. But that’s why God sent the prophets – to wake us up and challenge us to more fully participate in his gracious covenant. Michael Lotti is a freelance writer. He and his family attend Holy Orthodox Church (OCA) in St. Paul, Minnesota. This entry was posted in Articles, Uncategorized and tagged Christmas, prophets on December 20, 2017 by admin. Christmas lights are up and plastic lawn decorations of that old jolly man in a red suit have appeared. Yet, that jolly old man is more than a cartoon caricature that we hope brings us the new iPhone in our stocking this year. In fact, the real Santa Claus was the Orthodox bishop of Myra in the early 4th century. We know him as St. Nicholas and he reminds us about the importance of giving to others. Because when we give, we have the opportunity to significantly change other peoples’ lives for the better – and there’s no better example than St. Nicholas himself. In the time of St . Nicholas, there was a man who was once very rich, but times became tough and finances were so hard that this man had to think of creative ways to earn money just to put food on the table. This man was so desperate to feed his family that he decided the only way he could get enough money was to sell one of his three daughters into slavery. This may sound very harsh to us, but in this time and place, this happened often. People who came upon hard times were forced to sell family members into slavery just to make ends meet. When St. Nicholas heard of this man’s plan to sell one of his daughters, he decided to help. Late that night after the family went to sleep, St. Nicholas stopped by and threw a bag of coins into the man’s home. The money landed in one of the girl’s shoes, which was set by the fire place. The next morning, the man found the gold coins which allowed him to buy food and host a wedding for the daughter he had planned to sell into slavery. As the story goes, St. Nicholas helped this man with all three of his daughters, providing money to cover wedding expenses that allowed all the daughters to marry good husbands instead of being sold into slavery. St. Nicholas’ generous gifts helped change this man’s world (and his daughters’ world) for the better. In this story, St. Nicholas’ gifts all landed in the shoes of the daughters, so it has become an Orthodox tradition to lay out our shoes on the eve of St. Nicholas Day (December 6th) in hopes of finding gold coins in them when we wake. The story of St. Nicholas reminds us that we should do more than look for gold coins in our shoes. We should look to walk in his shoes by giving to others to make a difference. Our gift may not be saving someone from slavery, but a gift as simple as a smile to a stranger or buying a coffee for someone can still make a big difference in their life. This entry was posted in Articles, Uncategorized and tagged St. Nicholas on December 4, 2017 by admin. There are poor people; there are rich people, and everything in between. We, all of us, want and hunger for something. Sometimes even unbelievably, in our own communities regardless of size and resources, it is for food. And wit h food come feelings of comfort, stability, strength, satisfaction, health, delight, memory, replenishment and rest. This dilemma of physical and emotional hunger is among us, has been with us, and will likely remain in humankind until the end of the world. In the New Testament, in each of the four gospels, there is reference to the poor and Christ’s relationship to them. The famous line: “For you always have the poor with you, but you will not always have me,” appears in some form in Matthew (26:11) Mark (14:7) and John (12:8), and in the Gospel of Luke we see many examples of where the tension between the rich and the poor is inverted so that the marginalized and the unimportant – those who hunger and thirst – are precisely those whom the Lord seeks. Jesus Christ, in word and deed, taught how important it is to consider the poor. In an age of plenty, in a highly developed country as our own, there are still problems surrounding access to good, affordable food. I would go on to say that hunger and homelessness are inextricably tied. Furthermore, homelessness – the instability and inconsistency of basic housing, can be tied to any number of social problems. It very often means, what are we going to eat? Can I have a shower? Where will I do my homework? Are my clothes clean for the coming day? What if I get sick? Where can I play or hang out? Not knowing where you’re going to sleep on any given night, or knowing that where you’re sleeping is temporary and not your own bed night after night, is most especially burdensome for children and adolescents, school aged kids. So what does this all really mean to us? If there will always be poor people what can we do about it? How can we solve the tension between poverty and wealth when the causes seem pretty big and complicated? And pretty ingrained in society? We start by simply seeing, recognizing, and accepting the poor and from that point not turning back. Never, ever, judge. The causes of homelessness and hunger can be complicated and are completely out of the control of the kids in a family. Never judge. Accept that you can’t know or perhaps even understand what people in this reduced and impoverished state must deal with. Being poor is stressful – a relentless balancing act of getting to the next day, or week, or the next month. To judge, especially if you confuse judging with “figuring out the problem” doesn’t help the person suffering in this state, and it is spiritually unprofitable for you. Always, without hesitation, do something. The world and all that is in it is ours to consider. Open your eyes my friends to this knowledge and do not turn back from the opportunity, that is any opportunity, to do something. One thing, or maybe lots of things. May I suggest that you do not seek to “make a difference.” Let your actions no matter how simple or humble be the difference. Collect some cans of food, serve a meal to the hungry, and pray for the poor and needy; become a social worker or a policy expert on social issues, or run for public office; whether you are an electrician, or a daycare teacher, an insurance salesman, banker, barista, or barber , worker bee or a dreamer – give, offer, donate, gather, feed, work, volunteer, and again, pray. Once, twice, countless times, whatever you can do. Take the opportunity. You don’t have to save the world; you simply have to be prepared to be in this world fully, and with love. It is what Christ asks of us all. Vera Proctor is the director of FOCUS Minnesota, an Orthodox charitable non profit providing basic-needs assistance to homeless and low income individuals and families. This entry was posted in Articles and tagged homelessness, hunger on November 20, 2017 by admin. Those of you named after the Archangels Michael, Gabriel, Raphael, or their feminine counterparts, no doubt realize the importance of the date November 8th when we celebrate the Synaxis of the Archangels and of the other Bodiless Powers of heaven. As Orthodox Christians, however, this date should be equally significant for all of us as the holy Archangels and angels play an integral role in our lives. That is, if we want them to. What do we know about them? We consult the Bible for the answer. Beginning in Genesis to the last book of Revelation, angels are mentioned over 200 times. We know nothing of their creation, nor when it occurred. They are not the cute, baby-faced cherubs often depicted in Western art. On the contrary, from scripture we know that they are imposing and powerful. They are celestial beings, bodiless spirits who can move with great speed. “So the living creatures came and went, vivid as lightning flashes” (Ezek.1:14). An angel has character, intelligence and a will of his own, just as we do; but naturally they do not resemble us. Unfortunately, we are not often aware of their presence because we seldom think of them, pray or talk to them. Yet our services are replete with the presence of angels. There are numerous prayers, canons, and akathists devoted to them; however, they are often ignored or dismissed as unimportant. For the monastic, though, angels are extremely significant. Our goal is to lead the angelic life, continually praising God as the angels do, and to implore them to intercede for our protection and guidance, not only for ourselves but for the whole world. Every Monday is dedicated to angels hence monastics fast on this day and one of the canons read at Matins is devoted to them. Both the Scriptures and the Fathers of the Church teach that there are guardian angels of nations, countries, churches, monasteries, families, as well as individuals. “He set the boundaries of the Nations by the number of God’s angels” (Deut. 32:8). “To the angel of the church of Ephesus write….” (Rev. 2:1). Claim this petition, thread it through your brain and heart, implore your angel to aid you on your path, to protect your soul and body from all danger and harm. Call him to mind throughout the day, build a relationship with him so that not only on November 8th, but every day you will feel the presence of your guardian angel and all the hosts of bodiless beings. Learn more about the feast of the Synaxis of the Angels and Heavenly Hosts. This entry was posted in Articles and tagged angels, archangels, bodiless powers, cherubim, dominions, guardian angels, heavenly hosts, intercession, powers, prayer, principalities, seraphim, spiritual life, thrones, virtues on November 7, 2017 by admin. An interview with Jacob Souček, a new regular writer for this blog. Q: Tell us a bit about your background in music. A: My dad, who was an OCA priest (may his memory be eternal!) among many other things, was a prolific musician and composer. When it was time for me to choose an instrument to play in grade school, without prompting from my father, I chose the violin, not realizing how the apple didn’t fall far from the tree. Before entering the priesthood, my dad was a semi-famous violinist in Czechoslovakia and was a big influence on me musically. I progressed quickly with my violin studies through grade school and High School and was soon taking private lessons with a professor at our local college. My dad also worked at home preparing me for entrance into the Juilliard School of Music. Ah, High-School, that’s when things got interesting. I loved violin, but also loved rock ‘n’ roll! I started listening to all the 80’s hair bands with screaming guitar solos, and thought to myself, that’s what I want to do! I taught myself to play guitar, retiring the violin to pursue my passion. My dad wasn’t on board at first, but soon realized my talent for the guitar and how I was growing as a musician. He was completely supportive of me being a rock musician and playing gigs with local bands. I could play shows on Saturday nights as long as I made it to Liturgy Sunday mornings, as I was the head altar boy. After high-school I moved to Hollywood, CA and played in a band called Souls on Fire for many years. We recorded several albums in major recording studios, one of which was where Metallica and Aerosmith also recorded. We even worked with Steve Gallagher the engineer for Sugar Ray’s album, “Floored”. We played at world famous venues and had a large, loyal following. Our band didn’t make the big time, but I feel we did make it in some capacity. Q; How do you bring your love of music to your Orthodox Faith? A: Music is a gift from God! It is deeply rooted in our everyday lives and church life as well. The Cathedral where my family attends has an outstanding choir and the layer of beauty they add to our worship is something that is other-worldly. It helps us to connect with God and His angels who endlessly praise Him by singing “Holy, Holy, Holy!” Music has been such a blessing in my life as a Christian, a fan, and musician. Q: What kind of music do you prefer to listen to and why? What inspired you to seek out that type of music? A: I can listen to pretty much anything that has a good beat and melody, but it also must be intelligent and thoughtful. I prefer listening to artists that tell a story and I can feel the life experience they are expressing through their music which is real and relatable. Rock ‘n’ roll has always been my passion. Recently, I’ve been getting into some heavier rock artists and am intrigued with the complexity of their song writing, musicianship, and lyrical themes. It inspires me to possibly start a new project, we’ll see what happens. Q: What kinds of music should Orthodox Christians listen to? A: Well, I guess that’s up to each person to answer for themselves. I for one say, Rock on and listen to whatever you want, whatever uplifts you. Of course, try to avoid music that contradict church teachings. Q: How can others seek inspiration from music? A: Music is a personal journey and what might be inspiration to some may not be relatable to others. That being said, I would say try to recognize the diversity of music in different settings. Listen to your choir at church and feel God and His angels surround you. Listen to your favorite song that fills you with hope taking comfort in the fact that the artist is going through the same things you are. This, to me, is the gift of music! Q: Why is finding inspiration in music such a personal journey? A: We are all different, thank God! He made us all unique with unique personalities. The kind of music one listens to is unique to themselves. Even though, generally, we can all say that music makes us feel some kind of emotion, individually deep down inside only we know why a certain song, lyric, or riff inspires us. A: I wanted to start by saying, I’m very excited to be afforded this opportunity to connect with other Orthodox Christians and share my love for music. You can expect many different topics from this blog. Ranging from my thoughts on the music, music industry, and artists of today as well as the past, to what inspires me personally as a musician and Christian. You might even see some album, song, or artist critiques and reviews of bands I went to see live. It’s pretty much wide open, I don’t have a set theme. It’s going to be a diverse music forum. I’m also open to topic suggestions from my readers, or even a reader Q & A. I’m looking forward to taking this journey! This entry was posted in Articles and tagged music on October 23, 2017 by admin. This past summer, I didn’t spend much time at the beach or the mall. Instead, I served as a summer intern for the Orthodox Church in America’s Department of Youth, Young Adult, and Campus Ministries. I chose this instead of a multitude of other options because I knew it would be totally different than anything I had previously experienced and also an opportunity to take on a challenge while contributing my time for the benefit of the Church. Upon my arrival in Minneapolis, I began a two month internship which included work on projects and resources for the department, assisting with Vacation Bible School at St. Mary’s Cathedral, being on staff for the pan-Orthodox St. Mary’s Summer Camp and being a counselor for the 4th annual IOCC Serv-X-treme Conference. Each of these different aspects of my internship illustrate the vast range of youth ministry. Each provided me with opportunities to respond to God’s call to serve those around me – regardless of age – and to see the image of God in each person. The biggest lesson I learned this summer was that on whatever avenue young people find themselves, there are opportunities for them to draw closer to God through His Church. This happens through their shared experiences and the relationships they forge with others. I believe this is important for everyone to remember that we as a Church can learn to love God and our neighbor. When I heard about the internship with the department, I knew it was how I wanted to spend my summer – even though it meant being away from home, not being with friends and family, and not doing what I had taken for granted during previous summer breaks. I knew t hat working for the church can be challenging in unexpected ways, but I persisted because the work of this department is so vital and because of the experiences I would have during the internship. Throughout my summer in Minneapolis, I had a passion to share my knowledge and experiences from the first year I had just completed at St. Tikhon’s Seminary. I also enjoyed connecting with young people and sharing our faith experiences as Orthodox Christians. Youth ministry can be challenging, but it can also be very rewarding, because it provided me with opportunities to listen to young people, hear their questions and learn about their interests, and share answers and my experiences. Young people are asking all sorts of questions about life and society, and the role of our Orthodox Faith in today’s world. What is our mission? How do we witness to Christ, His Church and the saints? My commitment to making this work a priority convinced me that any reservations I might have had needed to be resolved quickly, so I could immerse myself fully in working for the Department. My summer was unique and memorable in many ways, but most importantly, I am so thankful to have had this opportunity to serve as an intern, because it helped me grow as an individual and as an Orthodox Christian. Alex Norton is a second year student at St. Tikhon’s Seminary, South Canaan, PA. Having explored both the east and west coasts of the United States, Alex currently makes his home in the Washington, D.C. area, but dreams of someday being back in California. This entry was posted in Articles and tagged internship, youth ministry on September 6, 2017 by admin.